If you’re thinking of buying a waterfront condo, there is a lot to consider. First, is the waterfront life for you and second, is a condo right for you. Here are some things you might want to keep in mind. Waterfront living can be great. Great breezes that keep you cool and keep bugs away. An environment that is clean and encourages a healthy lifestyle. Beaches to walk run or swim on. And let’s not forget that resale values of properties are good, since properties are in high demand. If you decide to move inland, they make great investment properties to rent. There are drawbacks. Those same resale values mean buying is more expensive. Insuring your property will be expensive because of the possibility of natural phenomenon that can damage your property. Maintenance costs are more expensive because of corrosive salt or wet air. And then there are seasonal crowds. You have to decide if the payoffs overshadow the problems. What is great about condo living is that you don’t have the responsibility to take care of things like lawns or outside maintenance on the roof, sidewalks and so forth since you own just your unit. Many condo developments have great amenities like pools, gyms and clubhouses. Condo owners have access to these as part of their ownership. Again, it’s without the need to personally maintain them. Other positives include good resale value, but a lower purchase price and higher rental income. With the good comes the bad. Condo associations have rules. They generally cover maintenance of common areas, but also deal with what you can and can’t do. If you like to fix up old cars, most condo associations won’t let you do it in their lots! Some won’t allow holiday decorations on the outside of your condo, or even pets. Often there are rules about noise and other nuisance things to keep neighbors from fighting. Condo fees for maintenance can also be a con, because if a big expense comes up, you are required to pony up your share. You can’t decide to put it off as you would be able to do with a single family home. 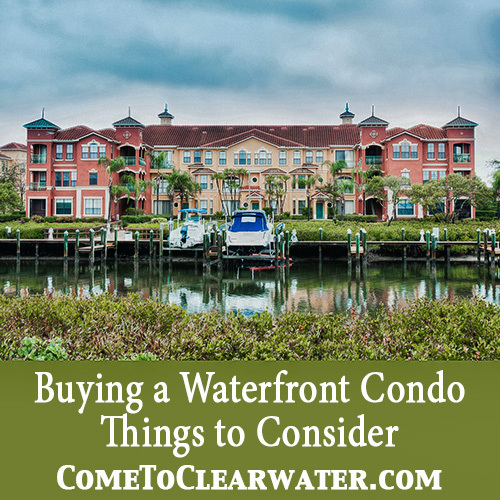 Deciding if waterfront condo living is for you has its pros and cons, but buying a waterfront condo could be just what you are looking for.